One of the things I appreciate with vintage Hamiltons is you usually don't have to worry about "counterfeit" models. That said, you do have to be mindful of recased movements or in some situations "frankens", or watches that are assembled from parts - as in Frankenstein. Every collector has bought a franken at one point or another. I recently had someone contact me regarding what they believed was a K-100 that would wind manually but not automatically. Being part of the 100 line, it would have a solid 18K gold case and there are not a lot of them out there. So I agreed to take it on. The K-100 was introduced in 1955 and produced for three years. In addition to the 18K case, it also has moveable lug covers that span between the lugs. The watch that I received was not a K-100 and I'm not really sure what it is, to be honest. If you look closely at the dial, it appears to be very close to a K-100 dial, but it doesn't have lines going through the hour markers and the numbers don't look like a perfect match. Check out the shape of the 8s, for example. The case isn't a good match either. The lugs don't appear to be even close to the K-100s, even if the lug covers were missing. The case back has no markings whatsoever. It looks like its been overly polished so perhaps the original markings were polished away? Well, the inside of the case back has at least a dozen watchmaker's marks inside from past overhauls. It's marked "Hamilton W. Co Lancaster PA" - so that's a good sign that it's a legitimate model. If it didn't say that I would declare this watch to be a franken, but I can't go there yet. I don't recognize the case maker's mark... let me know if you do. Moving on to the back, the movement looks pretty dirty so I wouldn't say this watch was cleaned any time in the recent past. I expected to see the rotor had come loose (explaining the lack of winding) but it's attached. Well, if the font of "AUTOMATIC" on the front of the dial wasn't a good clue, the markings on the back of the dial are a clear indicator that this dial has been redone at least once. Maybe it was a K-100 dial originally - but I'm still not sure based on the shape of the numbers. This is something you don't see every day... the main plate has been cleaned clear of it's nickel plating. It should be an even silver color but now it looks like brass. With the barrel bridge and train bridge out of the way, you can see the other side of the main plate is bare as well. I have a spare main plate from a parts movement - so I'll just swap main plates once I get all of the other parts out. I found the issue with the automatic winding. The bushings for the transmission wheels are oval. My tweezers are pointed at one, there is another just to the upper right. Looks like someone in the past put a jewel in one of the bushings for the reversing wheels, down by where it says "Swiss Unadjusted". This watch has had a LOT of wear and this underscores why it's important to regularly clean and oil mechanical movements. The train bridge goes on to cover the four wheels. The nickel plated main plate looks much better than the stripped brass plate, don't you think? The movement is now running, so it's off to the timer. Something is going on with the balance... a little too much noise so I'll reclean the hairspring. There, that's much better. Now to just slow it down a little by tweaking the regulator. Slowly the two lines approach horizontal. Now I will flip the movement over and put all the setting parts back on before reinstalling the dial. Now I can put a new rotor carrier on the back of the movement. This one has better bushings so the oscillating weight will actually wind the watch. The crystal that came with the watch was a little beat up but it was also too small and rotating in the bezel. Well, here's the finished watch. The over polishing of the back makes me think perhaps the front was over polished too - so maybe the lugs should be less rounded? There are only five 14K K-2XX models out there and this case does not match any of them. So this is an odd watch... let me know if you think you know what it is. UPDATE: The plot thickens... I had someone contact me regarding restoring a family piece that looked just like this watch - although it was equally beat up. I agreed to take it on, out of curiosity to see it, plus it's a Christmas watch - which are very hard to resist. The case is the same as my project watch above. Sort of makes you wonder where the hands went, doesn't it? 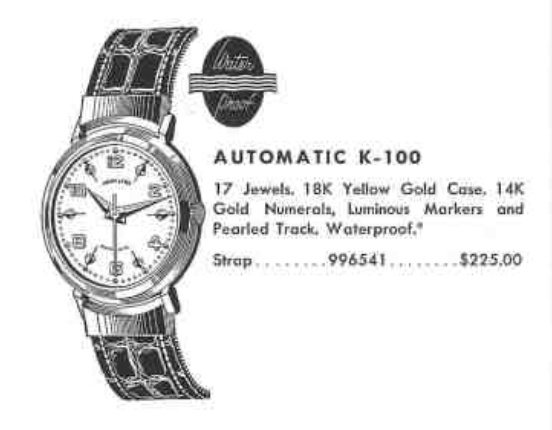 Notice the dial is very similar, although it's interesting to note that the markers are pointed outward like the K-100s. My project watch above has them pointed inward, but that dial was also refinished so they probably put them back on backwards. The case back is very worn and there's a faint engraving that says "To Wylie from Mother 12-25-56". I'm going to guess that it's been a few decades since this watch last saw a watchmaker. The stem and movement ring are a bit rusty so a little water definitely got inside at some point. The movement still ticks though - so that's a good sign. The inside of the case back is just like my other project watch although the serial numbers are no where near each other so there must have been more than one lot of cases ordered. The movement is now bright and shiny. I replaced the crown and installed a new, rust-free stem. With some replacement hands, a new crystal and a nice strap, the watch is back in nice running condition. You can just make out a few of the lines extending in from the hour markers (see the 11 , 9 and 7 markers) so although this dial was refinished at some point, there's still a little evidence of what it once looked like. A very light polish of the case back makes the engraving a little more clear. Wylie is still a little too worn to be legible but the rest is legible.